Halo: Combat Evolved Anniversary, commonly referred to as Halo: Anniversary, is a first-person shooter video game and a graphical remake of 2001's Halo: Combat Evolved. It was developed by 343 Industries in collaboration with Saber Interactive and Certain Affinity as part of 343 Industries' celebration of the original game's tenth anniversary. The game features remastered graphics and audio, using assets from Halo 3 and Halo: Reach. Available with the game are six remade multiplayer maps from Halo: Combat Evolved, Halo PC and Halo 2, along with a Firefight map based on the level Halo, for Halo: Reach multiplayer. 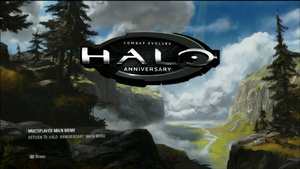 An interactive overview of the game, the Halo Anniversary Digital Experience, was released on the day prior to the launch, and is viewable on Halo Waypoint. Along with Halo 2: Anniversary, Halo 3 and Halo 4, Halo: Combat Evolved Anniversary was released on the Xbox One as part of Halo: The Master Chief Collection on November 11, 2014. 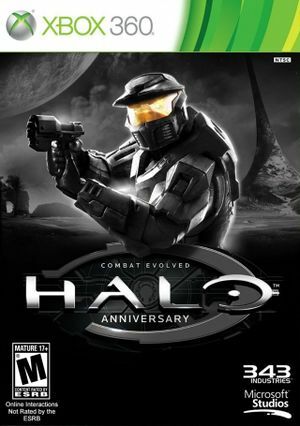 However, only the campaign portion of Halo: CE Anniversary is included, as the multiplayer and Firefight portions of the game are a part of Halo: Reach, a game not included in the collection. A graphical comparison of Halo: Combat Evolved Anniversary and Halo: Combat Evolved. The game features a graphics layer running on top of the exact Halo: Combat Evolved physics and gameplay engine. As such, gameplay mechanics from the original game, such as the M6D Pistol's three-shot kill, are all present. The game also features the ability to play the campaign cooperatively over Xbox LIVE with another player. Pressing the 'Back' button allows the player to switch seamlessly between the graphics of the original 2001 title and the 2011 remake. In the original 2011 version, this switch involves a fade to black; the toggle is instantaneous in the Halo: The Master Chief Collection version of the game, similar to Halo 2: Anniversary. The game features skulls, including five that have never appeared in previous Halo games. Achievements are also available. As the multiplayer component is actually running on the Halo: Reach engine, Theater mode is available there, but not for the remastered single-player. A Sangheili Minor as seen in the Kinect-exclusive feature The Library. The game integrates Kinect to further enhance the game-play experience for the single-player component. For example, players can reload their weapons, throw grenades, and switch between 'legacy' and 'remastered' graphics via voice commands. A new feature to this integration is the Library. When the vocal command "analyze" or "scan" is given, specific characters, vehicles and objects can be scanned. The Library, which cannot be accessed at all if the player does not have a Kinect, is essentially an index of detailed information on the scanned items. The remastered graphics are also available in 3D, provided that the player has a 3D television. Kinect integration was not included on the disc; the feature was released as an automatic update on November 15th. The Kinect features are not available in the Halo: The Master Chief Collection version of the game. Terminals are found throughout the game, which, unlike the text-based terminals of Halo 3, contain full-motion video narrated by 343 Guilty Spark. These terminals link the game's story to that of Halo 4. Anniversary also has subtitles available for in-game and combat dialogue. The multiplayer menu of Halo: Anniversary. A result of a collaboration between 343 Industries and Certain Affinity, Anniversary's multiplayer component runs on the Halo: Reach game engine, and includes six competitive maps and one Firefight map. The maps can also be played on Halo: Reach itself via the Anniversary Map Pack, a downloadable add-on bundled with the game. Alternatively, the map pack is available on the Xbox LIVE Marketplace for 1200 Microsoft Points. The multiplayer maps are remakes of maps originally featured in Halo: Combat Evolved and Halo 2. Each map has both an exact remake (minus visual aesthetic details) and a "remastered" version that takes advantage of Reach-era gameplay options. Forge and Theater support is available. The M6G magnum can be modified to function like the M6D magnum from the campaign. All non-vocal audio for the game has been been re-recorded by Skywalker Sound, while the original voice-acting remains untouched. The soundtrack has both a normal CD release and a 5,000-edition vinyl limited release. Both editions were released on November 15, 2011. Players have the option to choose between the original and the remastered score in the Options menu when pausing a campaign game. The game's ability to alternate between classic and remastered graphics in the Campaign was made possible thanks to a rendering engine developed by Saber Interactive. 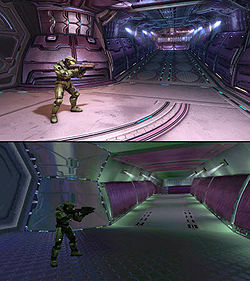 The technology allowed the developers to update Halo: Combat Evolved's visuals while preserving the original gameplay at the same time. The graphics and audio for the Terminals were produced by The Sequence Group, while most of the writing was done by 343 Industries Managing Editor Kevin Grace. Because of their previous contributions to the series - the Blastacular and Defiant map packs - Certain Affinity was approached once more by 343 Industries to streamline the multiplayer maps to take Reach's gameplay options into account. Customers who preordered the game received a code to download John-117's Mark V MJOLNIR armor for their Avatars. Preordering the game also gave access to the Grunt Funeral skull, which causes Unggoy to explode like plasma grenades when killed. The Halo: Combat Evolved Anniversary announcement trailer was released on June 6, 2011. It showcases the differences between the original Halo: Combat Evolved and Anniversary. A video documentary in which various 343 Industries employees comment on the development process and features of the game. A short trailer which originally debuted during the Halo Universe panel at the 2011 San Diego Comic-Con. It showcases the animation used in the terminals with a narration by 04-343 Guilty Spark. A behind-the-scenes look at the remastered multiplayer of Halo: Anniversary. Featuring exclusive interviews with 343 Industries employees, the video traces how the developers have chosen which maps should be remade for Halo: Anniversary, as well as the development process for the maps themselves. Integration with Halo: Reach's multiplayer component is also discussed. A behind-the-scenes look at the remastered campaign of Halo: Anniversary. The trailer feature exclusive interviews with 343 Industries and Saber Interactive employees, as they reveal the development process behind the campaign. A behind-the-scenes look at the remastered music of Halo: Anniversary, featuring exclusive interviews of Skywalker Sound employees as they discuss the recomposition of the original Halo soundtrack. A behind-the-scenes look at the new Terminals of Halo: Anniversary. The trailer feature exclusive interviews with 343 Industries employees and the motion design group Sequence, as they reveal the development process behind the terminals in Halo: Combat Evolved Anniversary. A trailer for the remastered campaign, with a voice-over by Captain Keyes. It shows several aspects of the campaign, including in-game cinematics and scenes from the terminals. Footage from Halo: Reach was used to explain the story's background. The Living Monument allows fans to upload pictures that are composited into an image of John-117, similar to the monument to NOBLE Team from the Remember Reach ad campaign. Heroes Never Die, a live-action short made to promote the monument, features an unidentified Navy commander presenting a eulogy dedicated to the men and women of the UNSC who gave their lives during the Human-Covenant War. The American restaurant chain Pizza Hut offered a unique pizza tailored for the release of Halo: Combat Evolved Anniversary. Those who ordered the pizza would receive a promo code for two free days of Xbox Live Gold membership. The pizza itself was prepared with onions, pepperoni, chicken, and peppers as toppings. This promotion was available from November 7th until December 19th 2011 and was limited to those who resided in the United Kingdom. June 2013 - Re-released as part of Halo: Origin Pack, which also included Halo 4, the Halo 4: Original Soundtrack, and a three month Xbox Live Gold membership. November 2013 - Re-released as part of the Halo Origins Bundle, which also included Halo: Reach. 2014 - Re-released as part of Halo: The Master Chief Collection, which also included Halo 2: Anniversary, Halo 3 and Halo 4 for the Xbox One. Halo: Combat Evolved Anniversary received generally positive reviews. Among the features which were praised were the game's remastered graphics and initial price. The Guardian stated that, "It's a mighty fine game – for my money, the best in the Halo franchise – that deserves to accumulate a cult following. Microsoft should be applauded for having the balls (and the money) to exhume it in such a magnificent manner." Official Xbox Magazine UK said, "The love that's gone into this HD remake makes it more than worth its budget price. If you've never checked out this series, don't get bogged down by details: Halo is about a big bloke shooting cool guns at cool aliens in cool places. Ten years later, that's still enough." However, the decision to integrate Halo: Reach's multiplayer within Halo: Anniversary instead of remastering the original Halo's multiplayer mode received criticism from various publications. IGN criticized such a decision, though they noted that, "If you can approach the experience with an open mind and are willing to take a few frustrating old-school design choices, and you're fine with a 'best of' map pack versus a full redo, then this is a great way to bide the time before Halo 4." The game was internally referred to as "Spark" during development. The Marathon logo is removed from the original Halo: Combat Evolved logo and is replaced by the outline of a Forerunner monitor. This is because the Marathon intellectual property is owned by Bungie, not by Microsoft Studios or 343 Industries. According to Frank O'Connor, John-117's abnormally proportioned helmet from the announcement trailer was being fixed prior to the trailer's release, though it was not completed in time to appear in the final E3 trailer. The pistol John-117 was wielding on the cover of Halo: Combat Evolved Anniversary was the Halo: Reach M6G. The Reach skin was used as a placeholder for the original M6D pistol seen in Halo: Combat Evolved. Although the Halo 3 skin is now used, the Reach version is still featured on the cover. Split screen in Anniversary has an incorrect field of view for each player. This was fixed in the Master Chief Collection. This was the last Halo game for the Xbox 360 to include a game manual. After the credits, while on the Extras menu, the credits for Halo 2, Halo 3, Halo 3: ODST and Halo Wars are shown. All of the credits videos are sped up by 1.25x. On Halo 2, the credits are based on the Vista version. On Halo 3, there is no background in the credits. In the beta version, the assault rifle used the MA37 model from Halo: Reach while still having a 60-round magazine. This was changed to a model more closely resembling the original MA5B in the release version. Full jacket cover art for Halo: Combat Evolved Anniversary. A promotional wallpaper of Halo: Anniversary. An alternate version of the wallpaper. John-117's Mark V armor, as a pre-order bonus for Xbox 360 Avatars. Promotional artwork featured in the October 2011 issue of Xbox Magazine. Concept art of Installation 04 in Halo: Combat Evolved Anniversary's menu. Another concept of the menu. Concept art of the level The Pillar of Autumn. Concept art of a corridor on the Pillar of Autumn. Concept art of the level Assault on the Control Room. Concept art of the level Two Betrayals. Concept art of the level The Maw. Main menu concept art depicting a UNSC hangar bay. Main menu concept art depicting a Covenant hangar bay. The main menu, a recreation of the original pan around Installation 04. Marines storm the beach on the level The Silent Cartographer. A view of the beach on The Silent Cartographer. Another screenshot of The Silent Cartographer. John-117 as he appears in Anniversary. An image from the redesigned level 343 Guilty Spark. An image of the multiplayer map Penance. An image of the multiplayer map Battle Canyon. The MA5B as it appears in Halo: Combat Evolved Anniversary. A screenshot of the redesigned level The Truth and Reconciliation. Captain Keyes and John-117 standing on the Pillar of Autumn's bridge in the redesigned level The Pillar of Autumn. Two Unggoy near a set of blast doors on the Pillar of Autumn. The Master Chief and a Marine engaging Sangheili Minors onboard the Pillar of Autumn.